Posted by Sheila Yoshikawa under Barerose, Donna Flora, Fashion, G. Field, Truth, u.f.o. I love this delicate lacey top from Barerose; it’s one of their new Mesh items and as usual you get excellent value with three pastel colours in the pack. 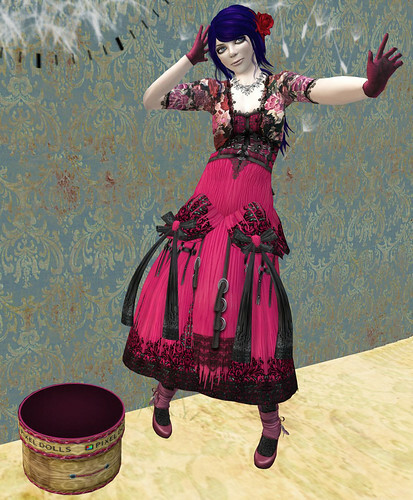 It comes with lace-edged leggings, but I paired it with a favourite maxi dress from G. Field and added some more romantic G.Field accessrories, the gloves and hair rose and some adorable flats from UFO (at the latest collabor88); see the picture below. This fluffy updo from Truth seemed to fit the mood perfectly and the jewellery is from the “70% off” wall at Donna Flora. Bronze is the latest in Luna Jubilee’s 52 weeks of colour challenge, and it is a nice autumn colour, so I took some of the pictures outdoors. My outfit got hippier and hippier, but the bag is the only thing I bought specially, it has really cute details. I got the mixx feather hair ornaments absolutely ages ago, but this is the first time I’ve really felt they worked nicely, in with the Tasmine loosely braided hair. I had a lot more fun with 52-weeks-of-colour liver than I thought: I turned the corner once I started channeling Helena Bonham Carter in one of her goth roles. 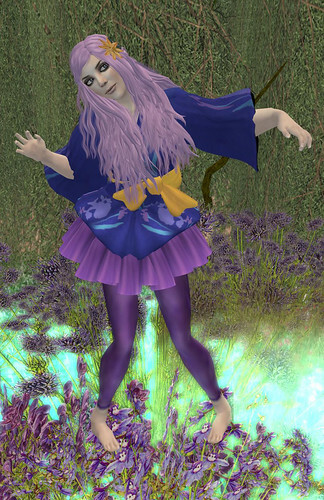 The only new thing was the lovely pair of boots: I’ve had this dress for ages and I bought the Zoe hair when it came out (I wish Exile still used this colour with their new hair, good mid/pale blues are harder to find). I was doing some random searching for a place to shoot some pictures and found the Kawaii Anime – Shin Akiba location, which had really good lighting and atmosphere. Jazzberry is the latest in Luna Jubilee’s 52 weeks of colour challenge. As is the case with several of these colours, it’s a case of “hope the right colour is in there somehwere”. It seemed somewhere between plum and raspberry, and if I wanted I could paint my RL room jazzberry though that paint looks a bit darker than Luna’s. The main bits of my outfit are from Bare Rose and as usual from them it’s very good value, with 3 colours and lots of bits and pieces. The Pixeldolls box is nothing to do with anything in the outfit, but I remembered that the box their stuff came in was a sort of vintage jazzberry colour. A quick “Bubblegum weekend” post, I added these pics to the pool at the weekend. People wear “unnatural” colours for the bubblegum challenges: I always wear an “unnatural” colour, so I could really just post EVERYTHING (or do a reverse-bubblegum, i.e. post in one of those weird so-called “natural” colours, like blonde 😉 Anyway, instead I’m taking the opportunity to do other colours, like purple or pink. The hair is Truth’s Hazel in granny colour, outfit is Barerose’s Ayame Hime (part of BareRose 24 Hour Release Marathon For Japan Relief Effort), hairflower by Ticky Tacky, Sunny leggings by Prelude. In the first picture I’m using the “zombie nurse” pose by Olive Juice, and in the second picture I’m riding Barerose’s ChaguChagu Umakko horse (also a charity item). You can ride along on it, and you can see it’s very prettily decked out.